Just because Conrad Murray is charged with a crime doesn’t mean that he is guilty. He is presumed to be innocent until proven guilty. The prosecution must prove its case beyond a reasonable doubt. Proof beyond a reasonable doubt is the proof that leaves you with an abiding conviction that the charge is true. Beyond a reasonable doubt does NOT mean no doubt. Evidence is sworn witness testimonies and the exhibits admitted into evidence. The remarks by the prosecution or the defense attorneys are NOT evidence, their opening and closing statement are NOT evidence. The questions by the attorney to the witnesses are NOT evidence, the witness answers ARE evidence. Don’t assume something is true just because one of the attorneys remarked that it was true. The stipulations agreed by both the prosecution and the defense must be accepted as facts by the jurors. Facts could be direct, circumstantial evidence or combination of both. Direct evidence can prove a fact by itself. For example if a witness testified that it was raining when he came into the court house, his testimony is direct evidence that it was raining. from which you could logically conclude the truth of the fact. For example, if a witness testify that he saw someone come inside wearing a raincoat covered with drops of water, that testimony is a circumstantial evidence that it may support a conclusion that it was raining outside. 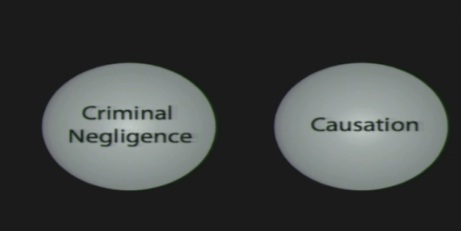 BOTH direct and circumstantial evidence are acceptable types of evidence. BUT if relying on a circumstantial evidence to conclude that a fact necessary to find Conrad Murray guilty has been proven, the jurors must ensure that the prosecution proved that fact beyond a reasonable doubt. If the jurors can draw 2 reasoble conclusions based a circumstantial evidence; one pointing that he is guilty, another pointing that he is innocent, the jurors MUST go with the one that points to innocence. The jurors decide on the credibility of a witness. They can believe all, part of none of a witness testimony. Jurors are to use common sense to decide. Don't simply assume that a testimony is false just b/c of inconsistincies; sometimes people can honestly forget things. If a witness lied about something significant, then the jurors consider NOT believing that witness' testimony but the witness lied about some thing but told the truth on something, jurors should consider believing in parts that they feel are truthful. If an expert was asked by an attorney an hypothetical question, it is up to the jurors to decide if the assumed fact has been proven. 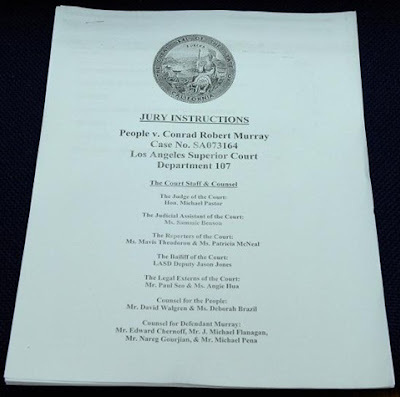 Character witnesses for Conrad Murray testified that he is "attentive, informative, careful, cautious, compassionate, loyal and knowledgable physician and has a good reputation for financial generosity and selflessness". Evidence of Murray's good character by itself CAN create a reasonable doubt but the evidence for Murray's good character can be countered by the evidence for his bad character for the same trait. It is Conrad Murray's constutional right NOT to testify. The jurors are NOT to make a negative inference that he did not testify. Conrad Murray's LAPD interview IS evidence but jurors must decide how much importance it carries. 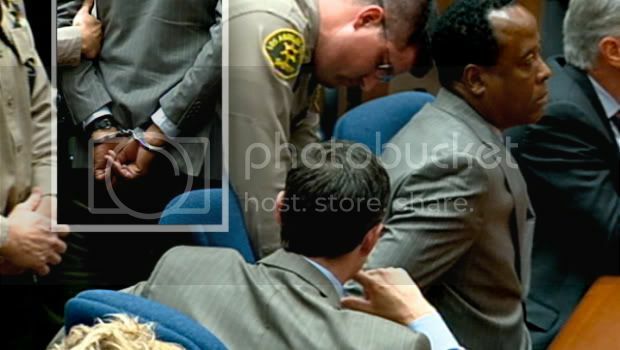 If you find that Conrad Murray made a false or misleading statement before this trial relating to the charged crime, it may show his guilt of conscious and the jurors MAY consider this in determining his guilt. If you find that Conrad Murray tried to hide evidence, it may show he was aware of his guilt but that conduct in itself can NOT prove that he is guilty. Jurors must decide on the importance of such conduct. In another words, a person acts with criminal negligence when he is SO different from the way an ordinarily careful person would act in the same situation that his act amounts to disregard for human life or indifference to the consequences of his act. a legal duty to treat and care for that patient. 2- A reasonable person would’ve known that acting or failing to perform a legal duty in that way would create a high risk of death. a legal duty and the death would NOT have happened without the act or the failure to perform a legal duty. A natural and probable consequence is one that a reasonable person would know is likely to happen if nothing unusual intervenes. An act or the failure to perform a legal duty causes the death if it is a SUBSTANTIAL FACTOR in causing the death. A substantial factor is more than a trivial or remote factor. It does NOT have to be the only factor in the death. (blogger- The key word in this trial is 'causation.' Following 2 illustrations were used by Ed Chernoff in his closing argument. 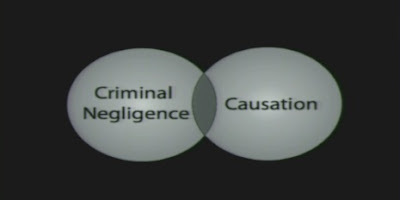 As per the law, simply being criminally negligent does NOT mean that Conrad Murray caused Michael Jackson's death. Did Murray's criminal negligence CAUSED MJ death. Did the actions or failure to perform a legal duty by Murray CAUSE MJ death? For example person A shots and kills person B. If A didn't shot B, would B die? Answer is no. A CAUSED B's death. To relieve the defendant of criminal liability, an intervening cause must be UNforeseeable and extraordinary occurrence. A defendant is criminally liable if either the possible consequence might reasonably have been contemplated or the defendant should have foreseen the possibility of the harm of the kind that could result from his act. Even if Michael Jackson himself caused his death but if Conrad Murray is the SUBSTANTIAL CAUSE, he is legally responsible for Michael Jackson’s death. (blogger: To explain intervening cause imagine A injured B and as B was being transported into an ambulance, B was struck by a lightning and died. The lightning is the intervening cause and A can NOT be the cause of B's death. If the juror believes that Conrad Murray, without criminal negligence, accidently killed Michael Jackson, he must be acquitted.